When a very unusual Citroen CX 2500 Familiale turned up for sale a couple of months ago, I went Internet diving. Which led me to this: a 2012 round-up of classic seven-seaters from Auto Bild called, Die Glorreichen Sieben-Sitzer. I do believe that is a reference to the classic Jock Sturges film, The Magnificent Seven, which is itself a Western remake of Kurosawa's early masterpiece The Seven Samurai. But with the exception of a 1977 Chevy Impala, these wagons are all as Euro as you can get. In addition to the Citroen CX, there's a Mercedes E-Class, a Volvo 940GL, and a Land Rover 110. 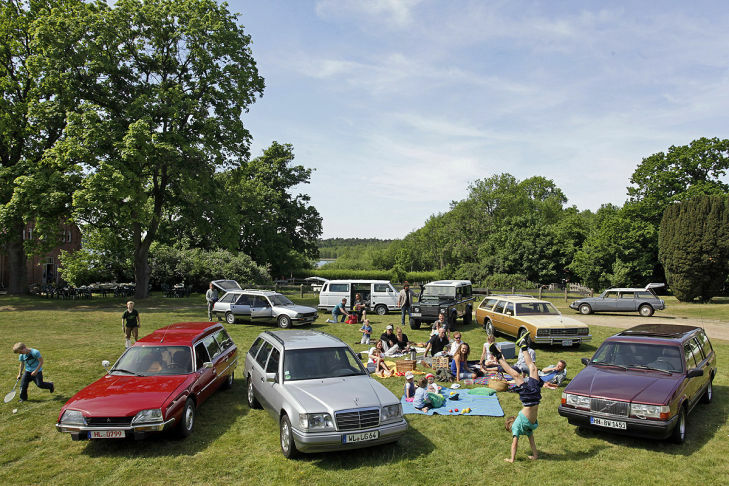 But there's also a VW T3 Van, a Peugeot 505 Familial--and another Citroen, the ID Break. I have two kids now, and even so, I can't imagine shopping for cars with seven seats, but I must recognize greatness when I see it. And this assemblage of station wagons and people movers is just awesome.